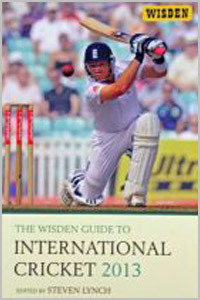 The latest Wisden Guide to International Cricket is another invaluable offering for the cricket supporter. There is a lot of interesting information on 200 handpicked international players as well as officials, the international playing schedule for 2012-2013 and an excellent team records section for Tests and One-Day Internationals. The 200 cricketers selected for the book are those likely to be appearing over the next year and each player’s page includes a lengthy profile, their key facts and statistics up to September 2012 which come courtesy of Cricinfo. Naturally, with the wealth of cricket being played during the English winter, the figures can be quickly out of date but the current ones can be found on Cricinfo’s pages. The lesser known nations are also mentioned and include Afghanistan, Ireland, The Netherlands and Scotland. The Officials section covers umpires, coaches and referees and is a useful section. The statistical section for all Test playing countries is most interesting and covers Tests and One-Day Internationals separately. Readers should enjoy having these figures in a concise, easy to read layout. The book ends with details of the international calendar for this and next year and I must say that this is a superb reference book and very reasonably priced.